A key symbol of the Easter holidays is resurrection. Christians may celebrate a famous resurrection on Easter Sunday, but according to the Bible, Jesus definitely wasn't brought back to life by dunking him in water. However, that's exactly how a new breed of preserved vaccines and drugs are resurrected, after being held in suspended animation in a special sugary glass - a discovery that could revolutionise vaccine delivery across the world. Kat Arney spoke to Cambridge-based scientist Bruce Roser to discover how the technology works. Bruce - All vaccines and many drugs are stored in the refrigerator. Absolutely, it have to be stored in the refrigerator because outside of the refrigerator, they're unstable. This is particularly true of vaccines and particularly a problem of vaccines because they have to be shipped all over the world to remote places without access to refrigeration. It’s an enormous job for the WHO to put a mine of refrigerators all the way from the factories in the west to remote towns in Africa. So, that’s the problem. How do you stabilise vaccines and other drugs so this is not required? Kat - Where did you look to for your inspiration? Bruce - The inspiration came out of the blue. I was asked to make a presentation at the Royal Society and one of my problems was that the reagents I was using are very unstable and a colleague suggested to me that I read a paper about how to address unstable proteins with simple, natural process. So, I read this up and I discovered these living organisms called anhydrobiotic organisms that were able to dry out during a drought and then come back to life again when water was added back to them even after a hundred years. 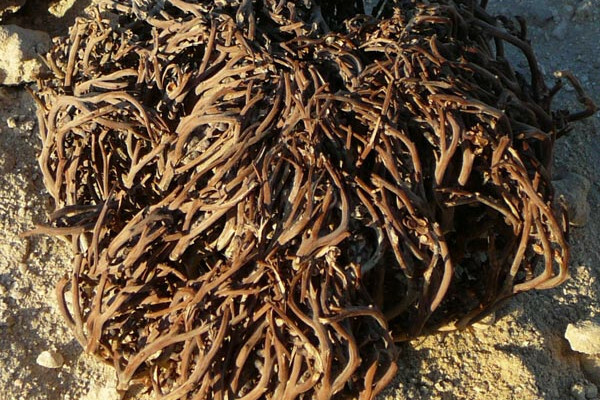 These are things like the resurrection plant. There are also some animals that do this and of course for example, baker’s yeast. You can buy those dried powder in the supermarket, add water to it and it comes back to life. Kat - Very appropriate if anyone’s been making hot cross buns this weekend I suppose. Kat - Tell me a little bit more about what's going on in these organisms to enable them to preserve themselves for so long. Bruce - When I started to study this issue, two things were noted by previous people where one had – these organisms could dry out and come back to life and the second is that they contained a lot of the very unusual sugar called trehalose. Being completely in this entire thought, well obviously, trehalose causes this phenomenon whereas almost anybody else who knew anything about it said this is much too complicated process for it just to be due to a simple sugar. But I did some experiments and found that the simple sugar would exactly replicate what was happening in these organisms. It turns out that the process is very beautiful and very simple. When you dry these organisms, all the sugar that they have inside their tissues doesn’t crystallise as the animals dry out the way normal sugar crystallises. But it becomes more and more viscous like honey which would’ve turned into a thick syrup. As you remove more and more water, it gradually solidifies into what's called a glass. These glasses are made of sugar so that they dissolve very easily in water. the molecules that were floating about in these organisms while they were alive become trapped in this viscous sugar solution and eventually in the glass so that they can't move about, they can't interact with each other and therefore, they can't deteriorate. So, they're trapped in suspended animation if you like in the sugar glass. Kat - It’s a wonderful image of all these little molecules just trapped forever, almost like Han Solo frozen in time in his carbonite. Bruce - Exactly. A better principle is probably some of the living insects that you see trapped in amber. These all happens at room temperature or above. You don’t have to use any freezing at all. Of course, that’s why it’s so valuable for vaccines in the developing world. Kat - If all you need to do this process is some molecules, some living things and some sugar, does it work for everything? Could you make it work for any vaccine you wanted? Bruce - Yes. We’ve done about – I think it’s about 20 vaccines and it works with all of them. We don’t have much doubt that it will work with anything that’s given to us. Kat - We’ve heard so much in media over the past year about the Ebola outbreak in western Africa. Do you think that potentially, Ebola vaccines could be preserved in this kind of way too? Bruce - What I know about Ebola vaccines, they are the sort of vaccines that we’ve worked with before, with which the technique works perfectly. Kat - It does sound absolutely fantastic. So of course, the big question is, how soon? When can you start getting this kind of preservation technique out into the world? Bruce - We’ve got to the stage now where we’re in animal trials. So, we’re hopeful that if our animal experiments go well, we should be able to get approved in humans very quickly. So, we’re talking about 2 to 5 years, hopefully, closer to 2.